30.07.2004 Vladimir Kramnik: FROM STEINITZ TO KASPAROV. The 14th world champion Vladimir Kramnik has imparted to us some of his thoughts about thirteen chess Kings: from Steinitz to Kasparov on the eve of the game of world classical chess championship with Peter Leko. - I got acquainted with the works of chess classics rather late. I come from Tuapse. It`s a Russian province, so there were problems with chess literature, one could get only the books about modern chess players – Karpov, Petrosian... Certainly, later I filled that gap in my knowledge, but for me it`s far easier to speak about those chess players, whom I`ve met at a chessboard – about Karpov, Kasparov. - And should modern young chess players study classical chess literature at all? - I think if one wants to succeed, then it`s necessary for him to pass mentally through all the chess history. I can`t explain this from the position of logic, but in my opinion it`s quite necessary to absorb all the history. - Starting from Gioacchino Greco? - It`s perhaps not so important to study such an ancient chess history, as that`s only the nuts and bolts of chess. But it`s good to know the works of Philidor and it`s absolutely necessary to have an idea of Andersen`s and Morphy`s playing. That must improve your skills. - Steinitz was the first to realize, that chess complies with some common principles, although it is a very complicated game. Before Steinitz chess players brought up only separate subjects; for example, Filiodor adduced and upheld the thesis:"Pawns are the soul of chess game". Steinitz began to look at things broader, to provide common base for separate conclusions. However, frankly speaking in his works there can be found quite a lot of examples of his decisions that do not quite correspond with his own rules. Steinitz began to get to some ideas, but he was far from getting to the heart of the matter. I think he was not very good at dynamics; the dynamics was obviously his weak point. 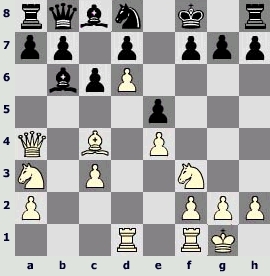 Thus, he constantly moved black pieces on very difficult positions in matches with Chigorine. For example, he took a pawn in the Evans Gambit and after that withdrew all the pieces to the eighth rank. One would want to resign in such a position, nevertheless he was defending it three times during the match – in the 1st, 15th and 17th games – and got one and a half points! Once he even won, but the position at the diagram is absolutely hopeless for Black. Steinitz was a strong practical player. He had profound and original ideas; for example, he asserted that king is a strong piece, which can defend itself. Certainly, the idea is original and in some instances it is correct, but it can`t be observed as the classical essential chess principle. People simply played chess before Steinitz and he began to study it. But, as often happens, the first attempt is merely an attempt. With all my respect to the first world champion I can`t call him the founder of any doctrine. He was an experimentalist and pointed out that there are certain regularities in chess, which are worth thinking about. - In my view Lasker is the pioneer of modern chess. When you look at Steinitz`s games, you understand that they have a smack of the past ages. And Lasker had a lot of games, which can be regarded as the games played by modern chess player. Lasker is the first link in a chain of "global" chess, where different elements of fight are taken into account. Steinitz put emphasis mainly on a certain element of position. For example, if he had the better pawn structure and a prospect to attack the king, he considered his advantage to be almost decisive. As to Lasker, he understood that there are different elements of a position, which balance one another. He realized that there are different kinds of advantage and that they may be converted one into another: tactical advantage changes into strategic one and vice versa. I think Lasker is more "broad" chess player than Steinitz. By the way, it`s rather indicative that the world championship match between them in 1894 (to say nothing of the return match) turned out to be absolutely one-sided. It seemed that two absolutely different in profundity of thought chess players were playing. Using modern estimation criteria we can say that one has rating about 2700 and the other 2400. That`s why Lasker gained such a clear-cut victory, literally "smashed" the opponent. I was deeply impressed by that match. I knew Steinitz to be a great chess player, but when I was examining his games, I saw a kind of massacre there. Honestly speaking, it was a culture shock for me; I`ve never seen such a great pull in world championships, as though it was not the match for the crown, but simultaneous display. Probably, Steinitz was already weakened by that moment, but not that much, he still showed quite good results in tournaments. Lasker is the great figure, he realized many global things in chess. Recently I`ve looked through his games again and was surprised: Lasker knew a great deal for his time! He was the first to understand the importance of psychological aspects of the game and began to take proper account of them, he was the first to modify his strategy and even partly his style depending on an opponent. While Steinitz stuck to one concept, he believed: this is correct and that is not correct. Lasker understood quite a complicated for those times (when chess was conceived categorically, in black and white colours) idea: chess is such a complicated game that it`s impossible to understand which way of playing is correct and which is not. One can act in absolutely different ways. Lasker was very flexible and he was not peremptory, perhaps, the first chess player in history who was not peremptory. He didn`t operate with such categories as "this is bad and this is good": for example, if you have occupied the centre – it`s good, if you have not – it`s bad. And therein lay a breakthrough in the chess science. It seems to me, in that moment when Lasker deprived Steinitz of his title, he was so greatly superior to the others as nobody else ever. Never was there such a gap in the history of chess. Until the new generation had grown up and the competitors, for example Tarrash, had become strong enough, Lasker stood head and shoulders above the others. - It seems to me that Tarrasch began to play stronger some time later, I wasn`t impressed by his playing in those years, when Lasker was vying for the title. - Tarrasch considered Lasker to be an upstart, because when he was already called "the teacher of Germany", Lasker was nobody yet. Steinitz challenged Tarrasch to match, but the latter evaded it. - Tarrasch didn`t seem to me a strong chess player. He had original ideas, but just as all chess players of those times, he was subject to categoricalness. And Lasker wasn`t and, perhaps, due to this fact he was notable. - I don`t deny that, but in my opinion, Lasker stood head and shoulders above the others in profundity, dimension and intensity of playing in the beginning of 1890s. Yes, this period of time lasted not for a long time, two or three years, and then he was run down by those, who evidently had learned from him. At the same time Lasker is underestimated value to some extent. There are the legends, that Steinitz is super-strategist and Lasker is mainly a psychologist... I`d like to destroy such legends. - By the way, not many people know that Lasker protested against attributed to him "psychological" influence upon an opponent and told: "My success is based mainly on the insight of a piece`s force and not on taking into account an opponent`s character". - It seems to me, his non-peremptory character gave him deeper understanding of chess. He violated the dogmata and everybody thought that it was done "in view of an opponent". And Lasker began to realize that these dogmata are not such indisputable. 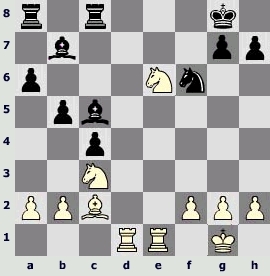 Let us remember for example his famous move f4-f5 in the game against Capablanca. Lasker realized that it`s possible to weaken the square e5, because it was difficult to be used. But everybody began to speak about psychological approach! It`s no psychology, Lasker discovered the profound concept, which now is used automatically: he let the opponent have the square e5, but he obstructed the bishop c8. He was the first to realize it so deeply. The whole point is not in psychology, but in deep insight of the position. Certainly he had the matches. One mustn`t forget about Rubinstein, a person of incredible talent, fabulous chess player. It`s a pity that he didn`t become a world champion, – he had deep insight of chess. Sometimes Rubinstein created undoubted masterpieces, he was well in advance of his time, – and to understand that, it`s sufficient to look through a miscellany of his best games once more. It puzzles me why he didn`t come close to a title of the champion. May be because of nervosity, may be, he wasn`t very good in practice, but certainly he was a man of great abilities. Lasker was the world champion for 27 years. He`s really a great figure in chess, but at the same time not all the fit contenders to the title could play, and not always the strongest chess players participated in such matches. - But Capablanca played the match by right! He had an unschooled talent of the kind, which, unfortunately, didn`t fit to large-scale hard work. It can be stated theoretically that if Capablanca had worked at chess as Alekhine or Lasker then he would have made more progress. But these are, in my opinion, mutually exclusive things: hard work is contrary to the nature of his talent. It wasn`t necessary for him. Capablanca may be compared with Mozart, whose music seemed to flow by itself. The impression was that Capablanca even didn`t know why he moved one way or another, it was his hand making moves. If he had worked at chess hard, his playing would have become worse, because he would have begun to think over something. And Capablanca had nothing to think over, he had only to move pieces! People say that he was defeated by Alekhine, because he had underworked. No, he was right that he didn`t work, otherwise he would have lost a part of his unique gift. So, Capablanca stands apart. In 1921 he defeated Lasker. By the way Lasker played in this match not so bad, he still had his practical strength. In my opinion it was the first world championship, in which both competitors played very strongly. It was the real match for world championship. Capablanca was younger, more energetic and a little bit stronger. In the last game Lasker made a gross miss, but before there was equal and very interesting struggle. In the previous matches for world championship, in which Lasker played, there was either massacre or a lot of mistakes as in his game with Schlechter. But there were only a few mistakes in the match Capablanca – Lasker, it was a serious game. Lasker is like a solid block, and Capablanca is naturally gifted person. Honestly speaking it`s surprising that Alekhine managed to defeat him. - It`s considered that it was his diligence to help Alekhine. -And also his character, his will...Certainly, Alekhine also had a great talent. Nevertheless it`s difficult to say, why he defeated Capablanca. It happened so, he was fated to do that. I agree with Kasparov that Capablanca didn`t bear the intensity of the struggle. Because he was pressing on the opponent in the match against Lasker and the latter defended himself. Although he was showing teeth from time to time, mainly he was defending. Alekhine in his turn not only bore the exertion, but also tried to increase it. Perhaps Capablanca didn`t bear such a violent mental exertion. He was accustomed to play more slackly at tournaments, to draw, to win some games through his talent, to be first or second, to have a rest, to have wine, - life is good!.. And suddenly - such a violent exertion. The match was very long, the games were serious and aggressive. In every game Alekhine constantly tried to create problems for the champion. - Is Alekhine really the first chess player, who began to work at opening contemporarily? - Alekhine was certainly a willing horse. He had strategic talent, he was the first, who felt keenly the dynamics. Lasker began to understand the importance of it, but the dynamics wasn`t the base of his playing style, he only remembered about it and "put it in" now and then. As to Alekhine, he counted on the dynamics and he perhaps was the discoverer of that trend. He showed, that it`s possible, certainly, having observed the positional principles, to put the game on a footing of dynamics. Not to look for long-term advantages, but to start weaving a net from the first moves, to threaten and to attack with every move. - At the end of 1920s and at the beginning of 1930s Alekhine left the others far behind. Or not as far as Lasker in his time? - It seems to me, it happened because "troublous times" came. Capablanca played not very often; neither Capablanka nor Lasker played in the tournaments which Alekhine won. Neither Botvinnik nor Keres had not gathered enough strength yet, "the old" were not in good form. Certainly Alekhine was an outstanding world champion, but his superiority, I think, is connected with that fact. I`d not say that in those tournaments he showed something different from what he showed before or what he showed in the match against Capablanca, he played almost the same way. Of course, Alekhine enriched his playing style, became more experienced, but I`d not say that he introduced something new. Why didn`t he leave the others behind before the match and after it he had such a large superiority? Honestly speaking, I don`t see any chess reasons for this. The match against Euwe showed that to a certain extent. - The fifth world champion is a Dutchman Max Euwe. It`s considered that he won the crown in a way undeservedly, almost by chance. - Euwe was a very good player. Botvinnik is said to found the system of global preparation, but I think Euwe was the first to do this. He realized the importance of opening and was perfectly prepared for the initial stage of the game. Besides he felt keenly, in what direction opening should be carried out. I was surprised that though Alekhine worked hard, he often bluffed, even in very important games he used dubious openings time and again. It means that he didn`t consider the opening to be dubious or hoped for the best. Euwe had fundamental organization of the opening, very reliable and rational. He was rather strong in openings. - Euwe`s approach was very competent, professional. He was quite a universal chess player himself. His style of playing was not brilliant, that`s why he was underestimated. He is somewhat "slippery", it`s difficult to "take him in hands" and to examine his style. Euwe is universal. I haven`t understood completely the main point of his style. May be it is in combination of different constituents. Besides he had a good nervous system, healthy outlook on life; he was very calm, steady person. All together it resulted in his champion`s title; and he absolutely deserved that, he defeated Alekhine quite normally. Alekhine was out of training indeed. But it`s not true, that he was out of training all the match long. He struggled furiously and at first he played brilliantly. That`s why one cannot say that Alekhine was out of training at the beginning of the match. But at a certain moment Euwe began to win and Alekhine went to pieces, he took a nip, then another... There were some other reasons: psychology or something else. So that was not the question of being out of training. In the opening Euwe did not "catch" him, but was keeping him in exertion. In the opening Capablanca defended himself against Alekhine, who already was considered to be very erudite chess player. And Euwe was doing everything for effect and often won opening battles. And not only in specific variants, but often even conceptually. For example in the Slav defense, which was played by both players, Euwe won the battle. I looked through the book about the match-revenge of 1937, it was the match on equal terms again. Alekhine is considered to have returned the crown to himself. They say he lost it when he was on a bender and then gave up drinking and won. It was not so. First of all in the period between the match and the match-revenge Euwe had beneficial score against Alekhine (3:1 in resulting games). In other words he kept on winning, though Alekhine gave up drinking rather fast. There was a struggle on equal terms in the match-revenge as well as in the first match. But in that game Alekhine had gone to pieces at certain time, and the next time Euwe suddenly went to pieces, he lost several games in a row. What happened, why did such a failure take place? Probably, Euwe subconsciously didn`t want to be the world champion any more, the burden of that title pressed him psychologically. However that may be, I think: everything, that happens, is obligate, but the myth that Alekhine won the match-revenge easily should be destroyed. - And now we`ve come to Mikhail Botvinnik – the first world champion, whom you knew personally. - Botvinik certainly was a new era in chess. I`d call him the first real professional, who understood that the result in chess depends not only on skillful playing. He was the first to reflect on complex preparing for competitions: not only openings, but also sleep, regimen, physical readiness – in that he was certainly a pioneer. It`s quite amusing for a modern chess player to read about the match Alekhine – Euwe: games were postponed, one of them took a nip, the other had a business meeting before the very beginning of the game... Nothing of the kind could happen to Botvinnik. - Did such failures happen to Botvinnik when he was young or only during his middle ages, after he was not playing for a long time? - It seems to me they happened all the time. Not the failures in tournaments (although sometimes that happened), but in separate games. When you examine his matches for world championship, you can notice that for some reason he always "went to pieces" in one or two or even in three games. I noticed that, but it`s difficult to find the reason. I just wanted to pay attention to that fact, which was left out by the commentators for some reason. In any case it`s not so important taking into consideration the number of really outstanding games he created. Botvinnik suggested many conceptual ideas in chess. - There is an opinion, that Botvinnik was winning due to his character, determined mood, and some of his opponents were more talented. - I agree with this to some extent. On the other hand a talent is such a phenomenon that doesn`t exist separately from other components. Talent is something elusive. There are chess players, who don`t achieve any striking results, but they are considered to be very talented. That`s the phenomenon. But I think that talent is only one of constituents in chess as well as in any other kind of activity. And it may be not as important as for example a character. That`s why a statement like "he is a talented man, but things did not come round, because he didn`t have enough backbone" says nothing. Probably one may agree that Botvinnik didn`t had purely chess talent as that of Capablanca, but he managed to achieve good results in other constituents – in character, training, and it`s not easier to achieve that as a matter of fact. He was a genius in these spheres. That`s why all that was said above doesn`t belittle the services and significance of Botvinnik as a chess player, because a potential is one thing and realization of it is another. Chess career of Botvinnik is a career of a genius in point of fact, though in my opinion he wasn`t a genius. - Did Botvinnik take a step forward in purely chess creativity in comparison with his predecessors? - He "raised" a number of conceptual ideas. But however "criminally" it may sound, I don`t think that he advanced chess, introduced something quite new in the game of chess itself. But his contribution in preparing for game is enormous. Besides, it`s a matter of taste as to regard preparing as an element of the game or to view them separately. In my opinion preparing is a constituent of chess. And if to compare Botvinnik with Capablanca – Capablanca was far more talented, he was really a genius chess player – then the contribution in chess of Botvinnik is far more. - What impression did produce a personal contact with Patriarch on young Volodya Kramnik? - Very, very good. I realize that he was a contradictory person, and his colleague possibly had grudge against him. I`ve heard various points of view, but I don`t want to comment them; not because I try to keep myself aloof from that, but because I wasn`t living at that time, about which I was told, and I didn`t see the events with my own eyes, that`s why it`s difficult for me to comment "thoughtfully". I knew Botvinnik in his last years of life and he produced a very favourable impression on me. I`d like to point to the fact that seemed strange to me: a kind of inconsistency between his views and his nature. Botvinnik sincerely believed in communist ideals; besides it was visible that he had reflected on that a lot and really came to believe in them. And at the same time he was very intellectual and educated person, with manners of a Petersburg professor that have nothing in common with post-revolution Russia. It is a puzzle to me how he managed to reconcile communistic views and true character of an intellectual. This inconsistency amazed me. Because Soviet intelligentsia, as a rule, showed merely hypocritical respect to communistic ideals, it was all in the game. Certainly Botvinnik was very peremptory. Therein surely lay his strength; it appears to me that he must have been peremptory temperamentally. But this categoricalness probably hindered in his relations with people, that`s why Botvinnik had a lot of friction with people. - How the seventh world champion Vasiliy Vasilevich Smyslov can be described? - It`s, to put more precisely,...the truth in chess! Smysov is a chess player, who plays correctly, very honestly and has very natural style. Why by the way he doesn`t have any aura, touch of mysticism, as for example Tal or Capablanca? Because Smyslov is not artistic in chess, there is no artistry in his playing style, it`s not bright. But his style attracts me. I`d recommend first of all studying Smyslov`s games to the children who learn to play chess. Because he played correctly; his style approaches to the virtual chess "truth". He tried to make the strongest move in every position and it is most likely that Smyslov surpassed many other world champions in the number of the strongest moves. That attracts me as a professional very much. I realize that amateurs prefer mistakes, ups and downs. But from purely professional point of view, I think that Smyslov is evidently underestimated. He had well-run all the constituents of the game. Smyslov brilliantly played endings and on the whole his playing flew fluently like water. When you examine his games – there is a feeling of facility, as if a hand moves by itself and the man doesn`t exert himself at all, has coffee and reads newspaper! The feeling of a Mozart`s facility! There is no effort, strain; everything is easy, but brilliantly. That attracts me in Smyslov; I like his games very much. - Smyslov and Botvinnik played against each other nearly a hundred games, participated in three matches for world championship. Were those games of high quality according to modern standards? - Yes, these are already top-quality games. Certainly there were mistakes, because matches were long, but on average the quality of the game is very high. Though they had some misses, but I`d not say that influenced deeply the general appraisal of the game quality. And the average move strength was very high. - The irresistible force has met the immovable object – the opponents turned out to be matches, didn`t they? - In general it was an equiponderant strife, though the opponents advocated different views to chess. It`s a pity to some extent that Smyslov didn`t retain world champion title longer, because he is a really outstanding chess player in my opinion. When he was 63, he played in the final match of contenders! That points to the high-class of his playing. The chess players of energetic approach can`t play on such a level at that age and it means that Smyslov played not due to energy, vigour or character – he felt chess deeply. Botvinnik in spite of his greatness began to weaken, though he held out quite long. But phenomenon of Smyslov is beyond compare. Possibly he retained the champion title not very long because he didn`t want so much this title. It appears to me Vasiliy Vasilevich is not the person, to whom it`s very important. Under certain circumstances Smyslov could have been the world champion for about 15 years. - Did Smyslov play the same way as did the chess players before him? - No, he played some other, his own chess. He was a master of positional game and stood head and shoulders above his predecessors in positional respect. He was also good at opening and at tactics, but nothing more. Smyslov didn`t have any inconceivable conceptual ideas, but he had delicate accuracy and realized his ideas "right to a T". Probably he may be called the first chess player of high-purity game. To some extent Smyslov became a founder of the style, which was later brilliantly developed by Karpov: gradual increasing of positional pressure, based on the counting of short variants with the accuracy of a clock-work. - I hardly knew Tal, but I was lucky to play several games against him. In 1990 the strong open tournament took place in Moscow, in which Tal also played. I was very sorry for him, because he looked badly. We didn`t meet in the main tournament, and in our day off the organizers arranged a blitz tournament and a tournament for 15 minutes. - And how did you play? - There was draw in the blitz tournament , and in the tournament for 15 minutes I even won – Tal sacrificed a pawn, then another without sufficient compensation; he merely amused himself, had fun – relaxed in a word, that`s why the result in that case was of no importance. Tal could play very strong as before, if he was straining. By the way he played quite properly in the blitz tournament, we shared with him the second and the third place. I was 15 years old then, I didn`t play very strong, but I was quick in the uptake. And blitz tournament was rather good: there were 10 grand masters, one international master and me, FIDE master. One moment from the game with Tal sank deep into my mind. In one complicated and approximately equal position we had about half a minute of time each. I had made a move and noticed that the opponent responded with a very disguised tactical blow. And we had so little time, the moves were made merely by hand. And I was delivered that blow, after that my position became desperate! Not but that I was amazed – I realized, it was Tal, but Tal, who was already seriously ill... Anybody else wouldn`t find that quite complicated tactical blow in classical game. Nevertheless the game ended in a draw with perpetual check, when the flags were falling down. Tal is a star, a real chess genius. As far as I understand, that man was absolutely devoid of ambitions and played chess first of all for his pleasure – he enjoyed the game. Such an approach is absolutely not professional. But the talent was so incredible, that even with such an approach, being in this regard an amateur in chess, Tal became the world champion. In my childhood I studied not so many of his games; as I`ve already said, there were not many chess books in the province. When I grew up I certainly looked through the games of Tal. I can say that he was really a very strong positional chess player, though he had a kind of a stamp of tactician. Indeed, he felt tactics perfectly; but Tal, as any chess player of such a level, was a many-sided man. At the end of 70s – beginning of 80s he had the second wave of success, and he played in strict, positional manner, won a lot of brilliant positional games. - It`s assumed that it was cooperation with Karpov that influenced him in such a way. - But probably it`s impossible to be good at everything – man can be good at doing either one thing or another. - Yes, it`s impossible. It`s one more question to discuss: there is no chess player without weak side. Strong side to some extent causes the weak one. It`s impossible to combine the strongest features of Tal and Botvinnik, because they are two contradictory (in a sense of chess) figures. The Tal`s gift, his approach to game, lightness, large creative energy – all these gave him enormous advantages, but also had deep-laid disadvantages. Probably with such an approach it`s impossible to be the world champion for about 15 years, for example. It`s a bright flash, a star, which rose and fell, and apparently there is no other way for such men. Figuratively speaking, that star emitted so much energy that such a vigour can`t be borne by a man for many years, the man will perish. It`s very difficult to speak about Tal, because he is extraordinary, very bright, he`s a sort of phenomenon. I'm quite sure that he would have also achieved a success in any field of activity. He had fantastical pungency of wit. If he were a scientist he would probably become a Nobel prizewinner. Tal was not of this world. And, by the way, many people, who knew him personally, told that he had nothing in common with homo sapience. He`s a sort of extraterrestrial! That`s why chess, he played, were "extraterrestrial". To discuss his chess means as much as to discuss how Lord God looks like. - Was the next world champion more earthborn? - Yes, he is very worldling. To form a clear idea of the creativity of Petrosian, one needs to study it thoroughly. He is, to say more precisely, perhaps, very "concealed". It`s possible to say that Petrosian is the first real Defender. He is a man, who was the first to show that almost any positions can be defended. Petrosian is a man, who introduced an element of defense into chess; that element, which is being revealed now more and more. He showed that chess is the game with a great number of resources, including defense resources. Petrosian is a very profound chess player and his is not easy to be understood. It seems to me that he is presented not quite correctly. He is one of the few chess players, about the style of whom I didn`t get a clear idea after having studied a collection of his games. There is an air of mystery about him. He was a brilliant tactician and a brilliant strategist. But the positional element in his creativity wasn`t perhaps of such a level as that of Smyslov. Nevertheless Petrosian is considered for some reason to be the master of the positional game. Certainly, he is a chess player of such a high level, that he could be very good at everything but I don`t think that the position game is the strongest point of Petrosian. His strongest points are, of course, defense and very clear tactical eyesight, due to what he was so strong in defense. In order to succeed in defense one must be a brilliant tactician and see all the possibilities and all the tactical points of the opponent. I`d even suggest such a "seditious" idea, that the attack is a more positional technique than the defense. The attack can be based on general considerations, while the defense must be specific. Preliminary counting of variants and taking into account the position peculiarities are far more important in the defense than in the attack. Certainly, the brilliant feeling of danger of Petrosian must be mentioned as well. On this feature depends, to some extent, the skill of defense. Petrosian saw the danger from afar. I also think he could be quite unexpected. - There is an impression that he was developing quite slow and reached the top of his form when he was already more than 30. - There is a feeling that he is such a very "smooth" person: steady, quiet, balanced, with robust nervous system, a person of integrity. Petrosian`s development was the same: without failures, systematically, without hurry, nothing could deflect his purpose. - And what sort of man is Boris Vasilevich Spassky? - Perhaps in this case I would agree with the "official version": he is the first real modern universal chess player. I like his broad, large-scale style of playing. I think he himself also likes to do things in a big way, he doesn`t pay much attention to trivial details. Spassky`s style of playing resembles that of Keres, but the style Boris Vasilevich is more inventive, imaginative. Keres, I think, had some problems with imagination. Spassky is very accurate too, he resembles Smyslov in that clarity. But Smyslov is a quiet chess player and Spassky is aggressive. He has embodied the features of different chess players. He resembles Alekhine, because he knows the value of time. He is a very good strategist. Perhaps his tactical skill wasn`t perfected completely, sometimes he miscalculated a little. I think Spassky laid himself out in every game and chess was a reflection of his nature. It`s pleasant to look at his playing: large-scale, throughout the chess-board. He is in time for everything, he occupies the space, presses here and there... I examined the match Fischer – Spassky quite carefully and I can say that Spassky was in general equal to Fischer in the game. - In which respects did he yield to him? - He had quite incredible one move misses, in almost half of his lost games. I don`t understand what had happen to him at those moments. Indeed, his energy like that of Fischer and his violent vigour pushed everybody aside, even such a man as Spassky. But if these blunders were taken away, then the match would be equal in the way of playing. But it`s considered to be nearly "one-gate". It`s one of few matches of the world championship, where the score didn`t correspond to the real alignment of forces. In the second half of the match Spassky pressed, Fischer was trying to escape in every game. Possibly it was Spassky`s inattention to trifles that ruined him in the duel with Fischer: he miscalculated a little somewhere, missed something, "dropped a brick" in the won position, he considered it to be good anyway and decided not to calculate... So his strong side turned out to be the weak one. Perhaps, indolence failed him. I heard, for example, that Spassky didn`t devote much time to chess. He was lacking some professionalism. Spassky wasn`t firm enough, sufficiently result-oriented. It seems to me, it didn`t matter for him whether to play in a match for world championship or to take part in Leningrad championship – he had the same approach and training. And, of course, he had ill luck: it was the era of Fischer; there are few world champions who could wrestle against him! - What impression did Spassky make when face-to-face? - We communicated with him a lot, played for the same club, once I even was on a visit to him. He is very honest, sincere, clever and frank. I like and appreciate these qualities very much. And his game is obviously a high class one. When we meet, we discuss some positions sometimes: heis very quick to grasp the main point of them, his suggestions are always to the point. Strange as it may seem, I can`t say the same about Botvinnik. It seemed to me so, when I was at his school. Certainly, the suggestions of Botvinnik were always interesting, but sometimes he suggested something "not right". It happened very seldom, but nevertheless did. And Spassky – no, he always makes a good shot. He might calculate a variant not very perfectly, but he catches on a direction of a game in 15 seconds! The following episode is also illustrative. Three years ago we participated in the tournament devoted to Korchnoi`s anniversary, and Spassky, who was already past 60, won exemplarily one game against Short. And the Englishman wasnt seen in the position, in which he used to be strong! Perhaps Spassky didn`t show his worth completely by force of different circumstances, but anyway the games of his best years are very significant. - So, Spassky had ill luck – he got into the era of Fischer! - Some chess players were unlucky even more: they would certainly become world champions if there were no genius near them. - What should be told about Fischer? There was a feeling, that this person is destined to become the world champion and nothing can stop him. There was a feeling of predefinition. No sooner had he appeared when everybody knew everything about him! In my opinion, it was absolutely clear that he will become the world champion already 5 years before he became the champion. Such force!.. Spassky, as they say, was as if run over by a car. I think, any other champion would be defeated by Fischer as well. And not because they played much weaker, it was just Fischer`s destiny to break through any cordon. - Fischer was stronger than others due to his force, understanding?.. - At a certain moment it turned out that he had everything: energy, and force, and training, and strong style of playing ... As though all beams were focused on one spot! He almost had no weak points, - how to struggle against such a person?! All outstanding chess players have a period when they succeed in everything whatever they do; it seems to me, that Fischer was on top of his success during the cycle of games for the title and the match with Spassky. - It is considered – also Kasparov seems to have such point of view, - that it was Fischer who started modern chess. - No, I think, that Spassky`s chess style was not less modern than that of Fischer. Fischer is a path-breaker of modern opening preparation. Unlike Botvinnik who only realized the importance of preparation, Fischer has brought it to the modern standard: to create problems for an opponent every move, playing any colour, in any opening. Fischer right away "made their game full of problems", he created problems from the very first move! This « high-tension chess » were then updated by Kasparov, who seems to a certain extent to be the follower of Fischer. Fischer was the first chess player who was keeping his opponent strung-up from the first up to the last move, granting no respite not for a single move. Whether it is a positional or tactical game, his aim was: always to create maximum of possible problems for the opponent. He played very "energetic" chess. - So, did he perish? - I do not know. It is a pity that Fischer gave up playing, his match with Karpov would be very interesting. I want to come up with such an idea. The more chess develop and the stronger play the chess players, the less clearly their style is expressed, the less there are chess players with original style of playing. There is a tendency to the universalization. It can hardly be said that Fischer had "clear handwriting" - he was universal. One might call this a collective style. In his better years he had purity of Smyslov, universality of Spassky, energy of Alekhine ...He was playing very rationally and in fragmentary, irrational positions was not so strong – that was his only weak spot. Here Spassky overmatched him. Fischer was a clear plan game chess player. In this regard the victory of Spassky in the11-th game of their match when in a variant with the poisoned pawn he literally "tore Fischer into pieces" is very illustrative. The point was not in opening preparation, such way of playing did not come easily to Fischer. Certainly, these are all subtle nuances, an attempt to find a weak spot and to show, that first of all this is a person. Fischer himself admitted his weak sides. He tried to avoid that kind of chess. An utmost clarity of plans was his strength. Fischer was playing brilliantly the Spanish game. In this opening it is very difficult to create chaos on a board. - We can argue endlessly about the result of the match Fischer- Karpov. In your opinion, did Karpov have any chances? - Yes. It seems to me, that Fischer would have had more chances, but Karpov would also have the trumps. I think, first of all due to preparation because Fischer was «a lone wolf ». He didn`t have reliable assistants, and he played openings in a rather risky way. The only way for Karpov to win is to create opening problems for Fischer. By the way, I shall notice, that very good score in the match with Fischer had Geller. Geller was good at openings who thoroughly elaborated his plans, he was not an easy person to play with for Fischer. In my opinion at that moment Fischer was overmatching Karpov. But if the opening advantage of Karpov was weighty there would be fair field and no favour struggle. - Does Karpov proceed with universal style? - Yes, certainly. But also there is a kind of mysteriousness in his style; he can do things that anybody else can`t. It`s easier for me to speak about Karpov, than about other champions because my first chess book was the collection of Karpov`s best games. I studied him from the childhood, and I played a lot of good games with him. He is a universal chess player: a good tactician, he brilliantly counts variants, he is very strong positionally, but has a distinguishing feature. Speaking part in earnest part in play, he has disproved a postulate of Stenitz which reads: a player who has an advantage is obliged to attack under the threat of loss of this advantage. While Karpov, having advantage, was not moving, but his advantage was increasing! In my opinion, there were no players neither before nor after him, who were able to do this. I don`t know how he made it possible. This component of his game always amazed and delighted me. When, apparently, it was time to begin a decisive attack, he moves а3, h3, and a position of the opponent is destroyed. Karpov has beaten me in Linares - 94, in that tournament I scored 11 of 13. I had a worse ending, but there was nothing tragic about it. I was making normal moves but I do not understand why there appears a lost position. Even after the game I could not understand anything, though I was in the top ten. It was one of the few games after which I had a feeling that I`m a fool and understand nothing in chess! This is a rare thing to happen with high-level chess players, usually at least you understand the reason of a loss. This moment is difficult to describe, but there is something imperceptible, a kind of Karpov`s spirit. 22.h3 ¥f8 23.g4 h6 24.f4 ¥f3 25.¦d2 ¥c6 26.g5 hg 27.fg ¤d7 28. ¤:f8¤:f8 29.¦d6 b4 30.¤e4 ¥e8 31.¤g3 ¦d8 32.¤f5 ¦:d6 33.¤:d6 ¥g6 34.¥:g6 ¤:g6 35.¤:c4 ¤d8 36.¦e4 b3 37.ab ¦d3 38.¢g2 ¦:b3 39.h4 ¤f8 40.¦e8.Black resigned. Karpov is very strong and universal chess player, who doesn`t differ very much from others. But this "know-how" made him remarkable among other high level chess players. - Does he have strong features of a real player? - Yes, certainly, he is a player. And I don`t know any other person with such combative spirit. When I started to play supertournaments, I was amazed with his ability to re-form himself in the twinkling of an eye. Karpov is playing a game, he is under constraint, he has been defending and fortifying his positions for six hours, he becomes stronger – it`s difficult to breach his defense, due to the brilliantly counted he is well protected, - he seems to propose a draw. 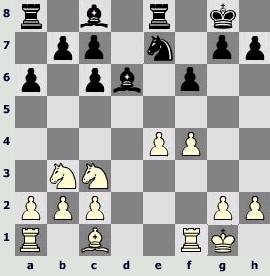 The opponent relaxes a bit, and the position becomes absolutely equal. Anyone would accept it immediately and would be absolutely happy to put an end to this torture. But Karpov could start to play for winning at that very moment! He easily forgot everything that was happening on a board up to the present moment, he was able to separate himself from a history of position. Karpov was not prone to revulsion of mood; there was a feeling, that had has just come and started to play a game. If there is any chance he tries to use it. Let's remember the victory of Karpov in the last game of the match in Bagio. Korchnoi began to win at the end of a match, I do not know why, may be Karpov was tired. One could clearly see that the advantage has passed to Коrchnoi. And suddenly Karpov demonstrates a splendid game! As if nothing wrong had happened, as if 5:2 had not turned in 5:5 as if there was no very difficult resumption of the game, when he had lost rook ending, - as if nothing had happened and in general this is the first game of the match! Despite being stressed because his further destiny depended on the result of the match, he was playing, as if playing at home on kitchen a training game: absolutely freely, being unreserved in manner. Certainly, he is a "warrior"! - To add some « human features » what weak sides did Karpov have? - It seems to me, he did not pay proper attention to strategy. As I`ve already told, he easily forgot about things that had happened on board, and, probably, there was a lack of strategic depth in his style. Karpov is a chess player of a plenty of short, 2-3-moves operations. Now he moved a knight, the next minute- has occupied space, the next moment- has weakened a pawn ... it seems to me, he was not a strategist by nature. And, as Fischer, could feel a little abashed when there was a chaos on board. Certainly, all these "weak sides" are rather relative. Probably, sometimes he was too self-confident. He believed so much that if necessary he will always find a way out that sometimes he didn`t control "excesses". Certainly, Karpov understood, that his position was getting worse, but, most likely, he thought: « Any way, I will win somehow! » There appeared a feeling of impunity and it let him down in the game with Kasparov. If in the first match Karpov rather frequently got out of doubtful situations with each new match he managed to do this less often. Probably, he was missing strictness in his style of playing. May be, this happened because before Kasparov appeared he considerably overmatched other chess players. So in the beginning there was no necessity in special strictness and when such necessity has appeared, it was already difficult to be retrained. - But probably Karpov was improving his playing during matches with Каsparov? - Certainly, Karpov was in progress as any outstanding chess player, he enriched his playing. But his "growth" was not so rapid than that of Kasparov who was "growing" with fantastic speed. In matches 1984 and 1985 there were playing two absolutely different chess players. Figuratively speaking, Kasparov of 1985 can give a pawn and a move to Kasparov of 1984. Talent of training has always been an advantage of Kasparov. Certainly, Karpov has this talent too but in this regard Kasparov left him behind. - Kasparov is actually a phenomenon in chess. Is it possible to say so about him? - Yes, of course. It`s actually difficult to speak about Kasparov. Firstly, because it`s my epoch in part, I`ve played a great number of games against him, secondly, because he is a chess player who almost doesn`t have weak points. At least I don`t know what his weak points were in his best years. It`s possible to write books about Kasparov. He is certainly a whale for work, I think even more than Fischer. Kasparov is a combination of lucky concourse of circumstances: having a good coach in childhood, good conditions for training, incredible will-power. Perhaps Kasparov can be compared with Botvinnik in his will-power, but he overmatches his teacher in flexibility. As I`ve already said, the peremptoriness of Botvinnik was his strong side, but however it had some disadvantages, whereas Kasparov, though being peremptory, is opened for any changes. He may, perhaps, in half a year, change his chess ideology. He soaks up changes like a sponge; modifies and includes in his armory very fast and successfully everything he sees. I think it`s the main distinction of Kasparov from all the other chess players. Objectively speaking, Karpov taught him much. Perhaps, before the first match Kasparov didn`t understand all the deep-laid advantages of Karpov, because they can be realized only when you begin to play with him. Karpov taught Kasparov a great deal in the match of 1984. As evident from the next matches between them, Kasparov became far stronger at those points, where Karpov was very strong. Certainly Kasparov`s talent is great. There are no components in chess, which do not lie to his hand. Many world champions had "not their strong points". And it`s not possible to say so about Kasparov: he can everything. If he needs to play brilliantly a certain kind of position, he will manage to do this. In chess there is nothing impossible for him. However it`s impossible to do everything brilliantly at a time. Almost at every stage of Kasparov`s career in his way of playing there are sides, which can be to called weak, because it`s impossible to keep your mind on everything at a time. But his tender spots, where he "gives under" a little, are not permanent, he can get rid of them in 2-3 months. But at once another weakness will come to light. And you don`t know beforehand which one. It`s very important to know how to take advantage of such "non-durable" weaknesses; because they won`t be any more. Obviously in 1984 Kasparov had some problems with defense, somewhere he was too impetuous, too aggressive. But already in 1985 he was playing in another way. Kasparov is able to realize what does not lie to his hand at this moment and can arrange the work well in order to cover up his weaknesses. He has incredible trainability, nobody else has the same! - In 1995, when you were helping Kasparov in his match against Anand, who taught whom? - Both. I think, I also have a sort of trainability. Perhaps, not that as Kasparov has, but I have it. Basically, we were just working, Kasparov wanted to win the match, and I was helping him, and I had no such dissembled thoughts as to learn something from him. Perhaps, we both got something useful of our companionship.